In all our judgments based on visual sensations, judgment and sensation have so grown together, that after a certain age it is scarcely possible to separate them: we believe at every moment that we sense something which we really only conclude. The previous pages have described color vision as a process defined at the sensory end by the photoreceptor cones and rods, and at the perceptual end by the three colormaking attributes. This traditional or "old testament" model of color vision, inherited from the 19th century, describes the perception of isolated color areas in impoverished situations at moderate to low luminance levels. In caricature, it assumes that color is equivalent to the trichromatic mixtures produced by light. This is the basis of modern colorimetry. color is a context judgment of surfaces viewed under light in space. To an amazing extent, color is defined by the entire three dimensional context in which physical surfaces are presented to the viewer. This is the specific meaning intended by the claim that color is in the mind, not in the world. It is not an illusion that is factually unreliable, but a complex judgment expressed as a perceived world of interrelated sensations. Context defines basic perceptual categories or basic forms of color that we implicitly use to judge color stimuli. This page describes the aspects of the viewing context that affect color perception and illustrates the most important perceptual mechanisms. Across all the basic forms of color, contrast is a key perceptual element. In many ways, contrast is the fourth and most important colormaking attribute. Color appearance is not usually defined by the physical attributes of the stimulus alone, but depends on the surroundings in which the stimulus appears, the adaptation of our eyes, and our recent visual experience. We encounter examples of this every day, and habitually ignore them, because the purpose of our visual experience is not to identify colors but to obtain a useful picture of the world. 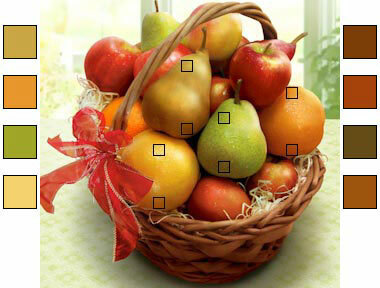 The classic visual example is color variation that appears in a basket of fruit (image, below). Although the skin of each fruit must in our experience be the "same color", the lit or shadowed surface colors, removed from the context and viewed as isolated color areas, are quite different. Note that the fruit's characteristic color is easily recognizable on the illuminated side, but not on the shadow side. The visual context actually shapes or moulds the color, in the sense that the color must fit into an interpretation of the world. The color is part of a whole. I use the idea of forms of color to emphasize that color is formed or shaped, or that color is transformed and made qualitatively different, depending on the visual context. An unrelated color is perceived by itself, isolated from any contrasting color areas or any visible physical context. A related color is perceived in the same visual field as one or more contrasting color areas; the color areas form edges or patterns with one another or against a contrasting background. A self luminous color is perceived as radiating (emitting or transmitting) light and therefore as having brightness. A surface color is perceived as a physical surface reflecting illumination and therefore as having lightness. Surfaces are normally perceptually distinct from lights, but in some contrast situations a color area may appear ambiguously like a glowing surface or a disembodied light. In the current color appearance terminology this is called an aperture color. A local color appears completely free of distortion from the intensity or chromaticity of the illumination or from any interposed tinting layer such as a surface reflection, colored glass, shadow, fog or smoke. A veiled color appears to be altered by an unusually intense or colored light source and/or an interposed tinting layer, including shadows. Lights are not normally tinted by other lights or by surface reflections, and therefore do not appear as veiled colors. However they can be tinted by transmissive media such as colored glass, a mist or a colored liquid, and in these situations the color of the light and/or tinting medium may seem to merge or mix. In the current color appearance terminology this is called volume mode. A plane color appears as color areas in two dimensions  without recession, binocular disparity or shadow; the illumination, if noticeable, appears diffuse and directionless. A spatial color displays recession and binocular disparity indicating unequal distance from the viewer; or specular reflections, the direction of cast shadows and spatial variation in the illumination intensity define the direction and relative intensity of one or more light sources. The color vision literature often refers to the spatial properties of an image, but often as not this actually refers to its two dimensional structure. I use the term spatial exclusively to describe an image interpreted as a three dimensional space, and use the terms spatial frequency, pattern or image to denote the two dimensional structure. Crank alert. My use of form of color rather than appearance mode is nonstandard and idiosyncratic. I use it to highlight the fact that the current color terminology is more convenient for describing color vision experiments than for distinguishing the perceptual factors that influence color perception. In a viewer's experience, the perceptual interpretation of the context is expressed in the color itself; we usually cannot, or only with unreasonable effort, separate the "real" color from its context. In particular, we are normally completely unaware of the "cognitive" aspects of color perception  discounting the illuminant, spatial perspective, shadows, memory, object concepts, available color labels, and so on. My slogan for this perplexity is: we cannot describe how we look at color, we can only describe how a color looks. The simplest possible color context is one where we can provide a color description, or a color name, for the color we see. This context is created in color vision experiments by the display of a single small color area against a large neutral background that fills the field of view, as illustrated below. The diffuse border represents the limits of the visual field as the viewer looks through an eyepiece or peephole into a gray, featureless chamber. Inside the chamber, color samples are presented through a circular window (called a reduction screen) as (1) colored light projected from behind onto a colorless, diffusing glass; or as (2) colored surfaces under diffuse, moderately bright illumination. The walls of the chamber are curved and the edges of the window are disguised so that the stimulus appears to the viewer as a floating, intangible, moderately bright disk of color. The surrounding gray area is usually illuminated to an equal luminance as the color stimulus, and its flat reflectance profile contributes no chromaticity. This is the standard presentation for an unrelated color or a color seen in isolation. (The purpose of the gray background is explained below.) In the presentation illustrated above, most observers would report (with confidence) that they see an orange color of moderate brightness and saturation.  a chromatic adaptation that reduces the saturation or chromatic intensity of the color in view by shifting the neutral point (N) of a chromatic range toward the dominant color  in the example, toward the color orange. These three color processes  a conscious "color" response, equivalent to naming or describing the color  and involuntary chromatic and luminance adaptations  continually adjust color vision to the viewing context. The main characteristic of unrelated color sensations is that they suppress the luminance and chromatic contrasts that shape color through the opponent functions. This means unrelated colors are completely described by the L, M and S cone sensitivity curves (or their practical equivalent, the colormatching functions of the standard observer). If the color has been created by light mixtures (for example, an orange created by mixing "red" and "green" light), the mixture is described by the mixing line in a chromaticity diagram. Color sensations in unrelated colors are very close to our cognitive color concepts or color categories  our ideal colors. Assuming the brightness and chromatic adaptations are in balance, a color always looks like itself. A lack of colorfulness or saturation in unrelated colors is perceived as a whitening of the color, and an increase or decrease in the luminance is perceived as a brightening or dimming of the color. The color appearance can be completely described using the colormaking attributes of brightness, hue and colorfulness. There are two visual illusions that appear in the unrelated form of color. The first is metameric colors, where two different spectral emission or reflectance profiles appear to be identical emitting sources or material surfaces (that is, two physically different lights or surfaces have the same tristimulus values or location in a chromaticity diagram). Metamers are created by the reduction in spectral information caused by the principle of univariance in just three color receptors. The second is afterimages caused by abrupt, large changes in brightness or chromaticity at the same location in the visual field. The vision science terms aperture color or film color describe the perception of color as coming from a source viewed through an aperture at an ambiguous distance. Aperture color is sometimes used as synonymous for unrelated color, but an "aperture" appearance is possible in related colors. For example, Ralph Evans found a fluorence quality, ambiguously between a surface and light, in the luminance contrast between a highly chromatic stimulus and a "white" surround. It might be useful to denote this ambiguous middle ground between a surface or self luminious color appearance with a term less specific to the manipulation of a color vision experiment (where colors are viewed through an aperture or produced by backlighting a transparent film). Note that any color that appears within a surround, even a gray or black surround, is actually a related color. This is a trivial issue if the surround (background) is adjusted to provide minimal contrast with the color area (usually a medium gray), because the surround is useful to suppress adaptation. The logical alternative  make the color area large enough to fill the entire visual field  is perceptually unstable. If the color area partially fills the visual field, adaptation will cause the color to desaturate and shift toward an average brightness and lower chroma. If the color completely fills the visual field and lacks any visible texture, this adaptation toward a dull neutral will (within a minute or two) produce a ganzfeld color or "whole field" color that eerily lacks any color sensation  including the sensation of a "middle gray". (For many viewers this state can be induced by cupping one half of a colored ping pong ball over each eye.) This is the most impoverished possible wakeful visual state, equivalent to blindness. It is normally disrupted by blinking or by involuntary movement of the eyes (nystagmus). Related Color. If a second color area is displayed nearby in the same context, customarily in the upper or lower half of the circular window, the viewer perceives two contrasting color areas at the same time, as shown below. Now the viewer can compare the first color stimulus to a second color in the same visual field. Any display of two or more colors in the same visual field, including a single color against a contrasting background, creates the second basic form of color: a related color perception.  The colors differ in chromaticity, so chromatic adaptation shifts toward the average of their mixed chromaticities, weighted by visual area. In the case of an added green light, the combined orange and green would produce a yellow mixture, so chromatic adaption would move toward yellow, decreasing sensitivity to yellow and increasing sensitivity to yellow's visual complement, blue violet.  The combined luminance and chromaticity difference between adjacent color areas causes a chromatic induction, which alters the perceived colors in relation to each other. In chromatic contrast the perceived difference between adjacent color areas increases on both lightness and chromaticity, visually separating the color areas; in chromatic assimilation the perceived difference between adjacent color areas is reduced on both lightness and chromaticity, causing the colors to appear more similar or visually blended.  The luminance ratio between two adjacent colors, or between a color and the background, may induce a brightness induction, so that the lighter color appears to glow or shine, or a lightness induction (discussed below), so that the darker color shows more blackness.  The colors form a border along a shared edge, which may cause edge contrast effects between them. Chromatic induction, brightness/lightness induction and edge contrasts emerge from a new level of perceptual structure that corresponds to the opponent functions and opponent contrasts between groups or clusters of receptors across the retina. These effects do not arise from the basic photoreceptor outputs. They are created when receptor outputs are differenced, summed, suppressed or enhanced by the secondary cells in the retina or the visual pathways in the brain. The spatial frequency (visual size) of color areas, which is determined by the physical size of the color areas as viewed from a specific distance, and is affected by the local spacing between receptors on the retina and the perceptual grouping of color areas into patterns, plays a major role in determining the direction and size of chromatic induction effects in two dimensional color displays. The principal visual illusions in related colors are the color shifts produced by chromatic induction. As a simple example, the three color areas in the diagram below differ only in visual size between a low frequency (large) or high frequency (small) contrast patterns. In each example, all four color bars above or below the small dots are identical image colors on your computer monitor. However, the wide (low frequency) bar on the dark background appears lighter than the wide bar on the light background, because chromatic contrast makes color and background appear more different. At high spatial frequencies, the thin (high frequency) bar on the dark background appears darker than the thin bar on the light background, because chromatic assimilation makes color and background appear more similar. Roughly, color vision enhances contrast between color areas large enough to count as different objects, and suppresses contrast between color areas small enough to be texture on a single surface. The activity of the opponent functions also produces hue dependent differences in edge contrast. The y/b dimension produces weaker edge contrasts than the r/g dimension, as shown below in the standard related color presentation. The top of the image shows this difference in edge contrast in the familiar related color presentations. The bottom of the image shows an identical color pattern presented in a black/white version (example b), or in yellow/violet (a) or red/green (c) at equal lightness and chroma. The r/g stimulus still produces color separation at high spatial frequencies when lightness or chroma contrasts are minimal; a comparable yellow/violet stimulus produces assimilation  an apparently solid color area. However at maximum chroma for each hue (an adjustment that also alters the lightness of the colors), the yellow/violet contrast (d) has greater clarity than the red/green contrast (f). This contrast also causes a significant desaturation (whitening) of the yellow color, which is visible if the identical yellow is used in a contrast with black instead of violet (compare d with the top half of e). The violet color is less affected, as visible when the identical violet is used in a contrast with white instead of yellow (compare d with the bottom half of e). This is a demonstration that the S cone contribution is less affected by pattern contrasts: most of the chromatic contrast effects arise from interactions between the L and M cones or their outputs. These contrast effects extend unequally into chromatic induction effects as well. The example (diagram, right) shows two of these in the contrast of high frequency bars colored either yellow and violet blue, corresponding to the y/b opponent contrast (top), or red and cyan, corresponding to the r/g opponent contrast (bottom). Effects both of chromatic suppression and spreading are strongest on the y/b contrast: lines that appear yellow against the gray background appear white against the violet blue background, and blue violet lines appear black against the gray background and gray against the yellow background. In addition, spreading causes the gray background between the blue lines to appear violet blue. These suppression and spreading effects are less apparent in the r/g contrast. The term "related colors" is sometimes used as equivalent to object or surface colors, but this is inaccurate. All related color effects may occur in color areas whether or not these can be identified as lights, surfaces or objects in three dimensions.  a lightness induction that causes the appearance of a surface color, which is strongest among many contiguous color areas of similar luminance and size. The figure at right illustrates both perceptual effects in a single figure. The three blue dots at the center of each cube face have exactly the same luminance on your computer screen. (That is, if the colors are sampled with the Photoshop color picker, they yield identical hexidecimal or RGB values.) 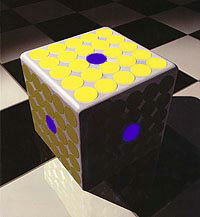 However, the upper face of the cube appears the most brightly illuminated and therefore the blue dot within it, because it has a much lower luminance relative to the yellow dots around it, and so appears darkened and attached to the surface. The cube face on the right is in deep shadow, and therefore the same blue dot has a much greater luminance relative to the shadowed surface around it, causing it to appear to glow dimly as a light. 1. The opponent primaries of brilliance (the visual quality of shining or emittance) or blackness (the visual quality of absorptance or partial reflection) define the opposing perceptions of self luminous or surface color  colors that appear to arise from the emittance properties of lights or the reflectance properties of surfaces. It is important to grasp that brilliance and blackness are perceptual qualities or symbols attached to relative luminance contrasts, and not physical quantities of light intensity that we perceive directly, just as red or blue are perceptual qualities attached to relative proportions of long or short wavelength light, and not physical colors that we perceive directly. 2. White is the transition point between brilliance and blackness  that is, white is only surface color that appears to have both zero blackness (light absorptance) and zero brilliance (light emittance). A point of comparison is the ganzfeld color that appears under constant visual stimulation. This might be described as a dimensionless, colorless, enveloping fog. It also lacks both sensations of blackness and brilliance, but does not appear "white". Brilliance and blackness, white and black, are perceptual symbols for changes and inequalities in visual stimulation across related colors: they disappear when visual stimulation is equal and constant across the visual field. 3. The brightness range or perceived luminance variation in self luminous colors is bounded by the physiological limits of light perception under the current luminance adaptation. Self luminous colors cannot be perceived has having less brilliance than a "white" surface in their local area, but the only upper limit is the point where the luminance completely depletes the cone photopigment or the light intensity causes visual stress  light blurring, intrusive afterimages, physical discomfort or blindness. However brightness is normally scaled to the current level of luminance adaptation: a candle flame appears quite bright in complete darkness, but is invisible in daylight. In contrast, the lightness range is a perceptual scale of grays closed at opposite ends by the sensation of whiteness or blackness. These comprise a range of physical luminance values that are defined in color appearance models as lightness values from 0 to 100, although for physical surfaces the actual luminance ratios are never greater than 1:33 and in most natural or artificial environments are less than 1:20. These two luminance related contrasts operate simultaneously in color vision (right). The average illumination determines the luminance adaptation, and the relative brightness of lights; the variations in luminance factor (reflectance) determine a lightness range anchored on white. The status of both adaptations is signaled by the quality of white and the chromatic intensity of surface colors. 4. Typically, lightness perceptions contain grayness or the "dulling" quality of a diluted blackness, the symbol of surface light absorption that is perceptually inferred from relative luminance differences. Similarly, brightness perceptions contain luminosity or an "outflowing" quality of brilliance, the perceptual symbol of light emittance. 5. The intensity purity of blackness or whiteness, or of luminosity in relation to background, depends on the relative area and spatial relationship between color areas. Brilliance or blackness are increased by (1) reducing the visual size of the color area, (2) increasing the size of the surround, and (3) increasing the luminance contrast between color and surround. These context factors can be experienced through aperture or fluorent colors, which appear "very bright" or "brilliant" but ambiguously between light emitting and light reflecting. To see this, draw a curtain over a sunlit window in an otherwise unilluminated room: the large rectangle of illuminated floor or wall in the daylit room becomes a narrow band of brightly shining light in the darkened room. By moving the curtain back and forth to adjust the width of the light beam, the illuminated wall or floor can be made to appear either reflecting, emitting, or glowing (simultaneously reflecting and emitting). A similar effect occurs in the luminance variations inside your home barbecue, where some coals appear in early afternoon light as orange lights, while others appear as surfaces painted a dull orange. Because these variations in illumination are common, near neutral surfaces with reflectances of 90% or less appear "white" in most situations. Thus, visual context plays an unusually important role in how white and fluorent colors are perceived. 6. A corollary to this is that grayed or blackened colors can only appear as surfaces, not as lights. Colors such as gray, ochre or brown only appear as surface colors. The corresponding stimuli, when presented as self luminous colors, appear to be dim white, yellow or orange lights. 7. The colormaking attributes for self luminous and surface colors therefore become different: self luminous colors and surface colors are still described by the attributes of brightness, hue and colorfulness (chromatic intensity or hue purity); but lightness contrast additionally induces the attributes of lightness and chroma (both judged in relation to the surface white). 8. Importantly, the direction, intensity and chromaticity of a light source does not appear in surface color perception: all color and lightness is imputed to the material the creates the color areas. The most luminous surface in the visual field becomes a "white" anchor (it may, in fact, be colored or dark gray), and the range of grays (surface color lightnesses) is distributed below this anchor in a way consistent with a single source of illumination. Surface color can be perceived in the absence of specific information about the location or character of a light source. The color appears through limited contrast between color areas (the apparent absorptance or blackness of surfaces), within a constant luminance adaptation. A color stimulus called a color mondrian is used to study color constancy, corresponding colors or context effects in related, surface colors. The mondrian is a quiltlike array of variously sized, overlapping rectangles that produces complex color contrasts within a limited luminance range (right). Originally (circa 1920) these were actual physical surfaces illuminated by diffuse, white light at moderate intensity; now they are increasingly presented to viewers as digital images on a flat panel computer monitor. In both cases, the colors appear as surface colors and there is no recognition of a remote source of illumination. The major visual illusions in surface colors or self luminous colors arise from a discrepancy between the actual and apparent illumination. This occurs through "false" luminance ratios produced by light vignetting or inexplicably large light contrasts. Thus, a computer monitor is really a pattern created by millions of faint lights, not a surface; the moon appears as a light at night and a pale surface during the day; a spotlight that is vignetted to match the borders of a color area can make the color appear to glow. Another "illusory" effect occurs in fluorescing colors, which absorb invisible ultraviolet wavelengths of light and partially emit the energy as visible wavelengths, which makes the color appear to glow (emit more light than is shining on it). The effect is enhanced by a "black light" or light source relatively high in short wavelength emittance. As long as the location and chromaticity of a light source are perceptually unspecified, all related colors appear as if illuminated by an ideal "white" or equal energy light source. This means we adopt the attitude that we see the material color as it "really is". Luminance contrast determines whether the color areas appear as lights, as surfaces, or as an ambiguous state in between, but the light does not seem to have a specific chromaticity or come from a specific direction. Local color is perceived as a surface or material body illuminated by a "pure white" illumination. We tacitly accept the good color rendering quality of the illumination at the same time that we perceive the surface color. This is the common perception of color under noon sunlight, or colors examined under balanced artificial light, and of the remembered or memory colors of objects. Veiled color is perceived as the visual mixture of the local (material) color and one or more spatially distinct tinting layers. This perception is distinctive because it automatically separates into two "local" colors  the color (lightness and chromaticity) of the surface and the color of the tinting layer. These opposing forms of color define a level of color complexity where several new factors are active. First, a spatial interpretation of color sources is essential to a veiled color perception. A veiled color is appears as some combination of (1) a translucent material in front of an opaque local color, (2) an opaque material behind a translucent local color, (3) a source of colored illumination in front of an opaque or reflecting surface, or (4) a source of colored illumination behind a translucent or transparent local color. Veiled color requires the cognition of two or more sources of color separated in space; this divided color is inherent to the color sensation. The examples (right) show that this may depend on the two dimensional configuration of edges and color areas, or on visual cues identifying a light source at a specific location, or both. Veiled colors are usually perceived in relation to three dimensional surfaces: color vision studies have shown that humans can reliably discriminate the difference between a three dimensional blue chamber illuminated by white light and a white chamber illuminated by blue light. But the examples at right show that the two dimensional structure of the image is by itself sufficient to create the appearance of a tinting source separate from a local (surface) color, which we interpret as transparency or cast shadow. Second, veiled color is perceived as a nuisance, in the sense that color vision works to eliminate or isolate the tinting layer in order to retrieve the local color of the surface. This adjustment is usually automatic or, if it depends on knowledge of the viewing situation, is not easily reversed once our knowledge of the situation is changed.  semitransparent tinting media located between the color area and the viewer (such as tinted windows, screen doors, sunglasses, photographic filters, smoke or mist). Obviously most of these situations involve a three dimensional interpretation of the image, and therefore fall under the next form of color (plane vs. spatial color), but my conjecture is that the spatial interpretation exerts a controlling function on processes that work equally well in two dimensions. The illustration below shows the minimal related color presentation necessary for the appearance of veiled color: two contrasting color areas (orange and white) displaying two contrasting chromaticity areas (neutral and tinted violet), with the color and tinting areas distinguished by separate (differently aligned or shaped) edges or boundaries. The simplest or most literal interpretation of the image is that it shows two semicircular color areas fitted inside two identically shaped and symmetrically placed rectangular arches. But we don't see it that way: the pattern is much more likely to appear as a white square containing a large orange circle that is crossed by the boundary between light and shadow, or as a square and circle illuminated by two light sources, one a bright white and one a dim violet. Either judgment  of a shadow edge or two contrasting sources of illumination  requires a "cutting away" or scission (a term coined by Fabio Metelli) of the color discrepancy as a tinting layer within the image. Scission attempts to retrieve a stable color judgment by peeling back a layer of distracting color to retrieve the layer of local color underneath (right). Two observations here. The spatial location of the shadowing edge or second light source is undefined, because there is an infinite number of geometrical arrangements that would result in the same visual appearance. So although veiled color creates a three dimensional perception of one material in front or behind another, the actual spatial distances involved (the location of a shadowing object, or the thickness of a tinting layer) can be undefined. Second, the perception of surfaces as white or very light valued seems to play a crucial role. On the one hand, it is very unusual to perceive a color seen as a white or light valued surface as being actually tinted or veiled. This is because the color of a surface and the light illuminating it mix subtractively, meaning that any tint in the light is perceived to darken the surface. At the same time, a smoke or fog often appears as a partially transmitting white, and the whiteness makes it visually distinct and lightens and desaturates any objects glimpsed through it. This implies that lightness contrast is a key factor in determining a scission. But anything that allows the extent and density of the tinting layer to be recognized and "pulled away" from the surface color can function as a scission tag. Key scission tags include: (1) specific edge or gradient boundaries that do not match the edges between background color areas (a diffuse edge crossing sharp edges, or a sharp edge over diffuse edges, or a straight edge across a complex pattern, etc. ); (2) a separate tinting shape that cuts across the color areas of a surface pattern or recognizable objects (reflections in a window superimposed on objects behind the window); (3) a uniform color shift that produces an equal proportional change in the lightness or chromaticity of a group of color areas; or (4) a global color shift due to the color of the principal illumination. In many instances, (5) deviations from memory color, our expectation of the local color that a familiar object or surface material should have, are also important. Veiled color arises from a complex perceptual inference, a visual hunch. With few exceptions  the perception of object shadows or relative changes in illumination  we are nearly always aware of a scission when it first occurs, often as a fleeting sense of intrusion or ambiguity or "recognition" of something blocking our view, as if the perceptual process must get conscious approval for its identification of a reflection, colored light source or tinting medium. This may occurs even with familiar tinting layers, such as reflections in water. Extremely large changes in apparent reflectance ("luminance errors") can occur if a tinting layer (or its pictorial representation) is altered in a systematic way, and these form the main category of visual confusions between local and veiled colors. In the wall of blocks visual pattern (left), the horizontal diamonds veiled by the sharp edged or diffuse edged "transparent" bands have the same luminance (lightness in the image) as the horizontal dark diamonds across the center, but they appear much lighter (center)! The effect is enhanced when the bands have diffuse rather than sharp edges (right). These effects are produced by a scission error. The trick is revealed in the bottom examples: the separate tinting layers were actually "cut out" in Photoshop along edges that exactly match the diamonds, which left the diamonds at their original lightness. However, the bands appear to be continuous between their horizontal top and bottom edges, which makes the diamonds appear "covered" by their tint. Peeling away this dark tint causes the color to appear lighter valued. The top examples show how the horizontal diamonds would appear if a truly homogeneous tinting layer were placed over them: now the diamonds appear slightly darker, but at the same time the "same color" as the middle row of diamonds in the main example. 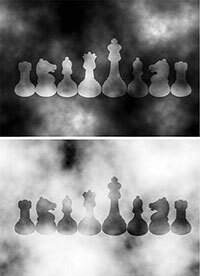 In the even more dramatic "chess pieces" illusion (right), the pieces again have exactly the same pixel by pixel lightness in both images, but their apparent reflectance is almost completely reversed, from luminous white to dark gray, by greatly increasing the lightness of a tinting layer of "smoke" swirling around the pieces while again performing a cutout or deletion of the tinting layer in front of the pieces. Amazingly, in this illusion the "luminous" chess pieces appear even lighter valued than the light background glimpsed behind them. There is a cute scission error in Steven Spielberg's film Terminal, when the reflection of a man's head in a mens' clothing store window seems to merge with a suit displayed behind the window, because the reflected head and headless shirt collar exactly correspond. The combined form of the torso and head fuse as a familiar single form (a human figure) which suppresses the scission. These examples demonstrate the extreme importance of corresponding or overlapping edges or disjointed forms as a scission tag. But scission can also be disrupted by coloring or contouring, for example using a contrasting color for the tinting layer, or by shaping the border of the achromatic "tinting layer" to run parallel to the dark diamond edges (right). In both cases the tinting layer illusion is destroyed. Without a scission tag the "tinting" attaches to the surface as a discoloration, or separates as an overlaid pattern. Perception of a tinting source is not a form of simultaneous chromatic contrast but a form of spatial perception. The lightness shifts produced by chromatic contrast appear in the achromatic diagram of parallel edges (right), and this lightness shift is much smaller than appears in the tinting layer with diffuse edges (above); and even minor color discrepancies can destroy a scission error that is very potent in an achromatic version. The difference in the achromatic or color keyed contrasts indicate that we are dealing with different contrast processes. The real significance of veiled colors does not appear until we consider the fifth and last basic form of color, which appears as the contrast between two dimensional and three dimensional colors. A plane color appears as a color area on a flat surface seen from a specific direction and made visible by illumination arriving from a specific angle of incidence to both the surface and the direction of view. The point of this contrast is that plane colors are seen under approximately the same illumination from the same point of view. There are geometrically simple changes in color appearance that, for surfaces illuminated by a distant light source (such as the sun), are due to changes in the viewing angle alone, or for surfaces illuminated by a nearby light source (such as a light bulb), are due to the joint effects of viewing angle and the distance and direction of the light source. However, there are fairly simple constants in viewing geometry that account for variations in plane colors. Spatial colors introduce two crucial new problems: they define objects, which occupy a specific volume of space and create different angles of view and light incidence across their different sides, and they define shadows, which affect both the color of the object's dark side and the color of other surfaces or objects it shades. These variations in light and shade are perceived as the modeling of the object and the location of the object in space. In the previous section I pointed out the importance of overlapping or aligned edges as a scission tag. By far the most frequent examples of veiled colors are shadows cast on surfaces, which turn up everywhere under nearly all types of illumination. Shadows mean that surface colors must be compared across significantly different levels of illumination. However the modeling of objects permits these veiled colors to be peeled away through the three dimensional perception of the objects itself. The cognition of objects illuminated in space becomes the scission tag for its own variations in light and dark. Spatial colors are just scission tags that correspond to objects. The cognition of objects illuminated in space extends to all the common sources of veiled colors: light reflected into shadows from nearby surfaces, shadows on an object, shadows cast by the object, highlights or reflections on an object, and changes in luminance or texture relief (surface gradients) due to changing distances or angles of incidence between a surface and a light source. All these veiled colors more or less disappear into the unified perception of material objects in different locations within a three dimensional scene. The diagram (right) shows the additional visual responses active in spatial vision, the most complex form of color. This is admittedly a parody of an actual inventory, because the visual processes involved in spatial colors are very poorly understood  for example, we cannot simulate them in robotic vision. However, it seems fair to assert that all aspects of our visual sense are unified in the experience of spatial color, the representation of a three dimensional material world under natural illumination. This might be called the principle of spatial dominance: vision strives to interpret a visual image as material surfaces illuminated in space. Spatial colors can only be disrupted by grossly and systematically impoverishing the visual image or by contriving an image that is inconsistent with a simple (parsimonious) spatial interpretation. The principle of spatial dominance is the basis of all visual illusions in spatial colors. The diagram below shows the difference between two arrangements of identical color areas. When the colored diamonds are arranged randomly (left) they appear as flat color areas inserted into a flat blue field. Each diamond is an autonomous color area and there is no layer tag that color vision can use to identify and adjust veiled colors: as a result the color variety is quite large. When rearranged to form a spatial illusion (right), the same colors are interpreted as opaque colored blocks and their cast shadows. This cognition allows rapid and silent adjustment in the colors interpreted as shadowed or as lit by grazing illumination: the variety in the colors is muted, and the illuminated and shadowed surfaces appear to be the "same" color. An achromatic spatial illusion (below) demonstrates how spatial color can strongly alter surface color to match or consolidate a three dimensional perception. In both figures the basic pattern is a 5 x 5 matrix of identically shaded achromatic "tiles", with the shape of some tiles changed in shape or orientation to create the illusion of a surface folded vertically (left) or horizontally (right). This is sufficient to produce contrasting spatial illusions and color changes: (1) each column appears as a flat surface crossed by alternating bands of color (left) or as a band of continuous color at different angles to the light (right); and (2) the apparent lightness of any single facet changes depending on the spatial interpretation: compare between figures the second and fourth facets of the middle column. These discrepancies are not noticed as conflicts or changes in color: they disappear into the spatial illusion. The modeling of the folded surface, the idea of its geometrical form in space, acts as a scission template functioning across its entire surface. Spatial colors can induce changes in chromaticity as well as lightness. In the spatial mondrian diagram (above), the trio of colors of the same hue appears more varied when viewed as isolated, flat diamonds (left) than when viewed as the three sides of a cube (right). At right, an orange color palette is shown two ways: with chroma (and saturation) changing across the vertical faces of the polygon and lightness changing across the horizontal bands (top figure), or with lightness changing across the faces and chroma across the bands (bottom). The positions of the color areas have simply been flipped around the righthand diagonal. Color vision interprets this geometrical picture as an object in space, working from the color changes to infer an illumination that will make the continuous stripes around the sides of the polygon appear to be the same local color. For the bottom polygon this is straightforward: the constant chroma within stripes and changing lightness across the faces suggest the illumination comes from the right. But the top polygon is not consistent with a single light source, because chroma but not lightness changes across the figure, which makes the lefthand face look too pale and desaturated. To account for this spatial variation in local color, color vision imputes a second light source. Both polygons appear illuminated from the right, but upper polygon appears additionally illuminated by a faint bluish light shining on it from the upper left. In the real world, shadows do not by themselves alter the reflectance profile or chromaticity of a color, they just reduce its luminance; so any change in shadow hue or chroma is perceived as arising from the chromaticity of a second light source. Colors are most strongly desaturated (shifted toward gray) by their complementary color, and saturation is strongly enhanced by lights with a hue similar to the hue of the physical color. Red orange is most strongly desaturated by its complement, blue, so a blue color is attributed to the inferred light in order to reconcile the decrease in chroma (but not in lightness) on the lefthand side of the figure. The diagram summarizes the relationships among the four forms of color described above. See below for the current standard terminology. If we summarize the forms of color as perceptual attributes, then colors are primarily contrasted as: (1) an isolated color area or a combination of different color areas, including a target color against a background color (contrasting color areas? ); (2) a luminance contrast between adjacent color areas that causes brightness induction or lightness induction (high or low luminance contrast? ); (3) the perception of color distortion by a colored light source, shadow, reflection or transparent medium (tinting source? ); and (4) the perception of related surface colors as forming a three dimensional pattern of light and shadow across physical surfaces (illumination in space?). Current Terminology and Concepts. To avoid confusion I describe here the standard color nomenclature and my impression of its shortcomings. The simple distinction between unrelated and related colors illustrates the main problem. In my sampling of texts published in the last decade, I find related colors defined as (1) colors seen against surroundings of similar luminances that usually appear to be reflecting or transmitting objects, usually having a gray content in their color (my paraphrase of R.W.G. Hunt); (2) a light viewed in the context of at least one other light (S. Shevell); (3) color perceived to belong to an area or object seen in relation to other colors (CIE official definition); or (4) surface color (P. Kaiser & R. Boynton). None of these definitions identify the essential perceptual attribute  two or more contrasting color areas  and most muddle up the definition of color with the description of a color stimulus. In the color research literature, a color appearance mode usually refers to the viewer's interpretation of the color context. The mode is an inferential, judgmental state in the viewer  a kind of "viewing assumption" about the visual field that fuses the perception of color onto a perception of physical reality. While cognitive factors are essential to explain color perception, the problem here is that viewers rarely perceive how they look at colors: they just perceive how colors look. As a result, the color appearance modes are usually defined in terms of the viewing situation  the experimental setup or physical description of the stimulus  in which cognitive assumptions can be expected to emerge, not in terms of the perceptual attributes that comprise the basic forms of color. Thus, a white surface that is illuminated by a red light is in illumination mode, and a red surface illuminated by a white light is in surface mode (or object mode); but if either surface is viewed through a reducing screen or eyepiece, then it is in aperture mode. This strikes me as a Borgesian way to anatomize color perception. In small field color perception, the spatial arrangement of color fields  especially as patterns and small color areas  strongly affects responses in the retina or early visual pathways. In wide field colors, visual grouping or a three dimensional interpretation of the scene have an equally large effect. All are spatial effects, but the meaning of "spatial" is very different in small or large field colors. In both domains, the spatial effects are typically discussed as dozens of discrete color appearance phenomena, each defined by a prototypical visual illusion; some important visual properties, such as small field iridescence, are orphaned in this approach.  Illuminant mode describes colors that appear to be or actually are lights. I prefer self luminous color to allow for the perception that results from strong luminance contrasts in surfaces, not just from light sources, and to avoid confusion with the technical use of illuminant to mean the spectral power distribution of a light source.  Illumination mode for surface or object colors that appear to be distorted by the color of the illumination. I prefer the terms local color to denote the appearance of a surface or transparent body seen under a recognized "white" or unbiased illumination, and veiled color to denote the perception of any kind of tinting source, no matter whether the tinting source is perceived to be the chromaticity of the light source, shadows cast by the illumination, a tinting reflection, or a filter or other semitransparent material.  Surface mode denotes colors that appear illuminated by a "white" light source. I prefer surface color to indicate a luminance contrast that induces the appearance of a material surface without imputing a specific quality to a light source, whether white (local surface color) or tinted (veiled surface color).  Object mode for surface colors that appear as physical objects in space. I prefer plane color or spatial color to indicate that the surface colors induce the perception of a continuous surface or objects in three dimensions.  Unrelated Color and related color are not considered modes because there is no cognitive contribution to the color perception; but for related colors this requires that there are no spatial or illumination cues created by the color stimulus.